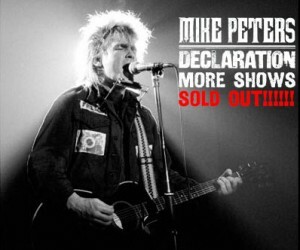 Mike Peters Declaration shows in the UK and USA are selling out. In the USA, both concert appearances in New York at the Iridium on March 15th have completely sold out after extra tickets were released last week due to public demand. Following on from earlier sell outs in Glasgow, London in the UK shows at Korks in Otley, Yorkshire and the Bristol Thunderbolt have both sold out. Ticket sales all across the UK are doing really well especially Edinburgh, Manchester and Newcastle and more shows are expected to reach capacity as the tour nears its opening night this Friday at the O2 Academy in Liverpool. Mike Peters / Alarm fans who are intending to visit other shows on the tour are being advised to purchase tickets in advance in order to avoid disappointment. Mike Peters – ‘Declaration’ 30th Anniversary Tour. 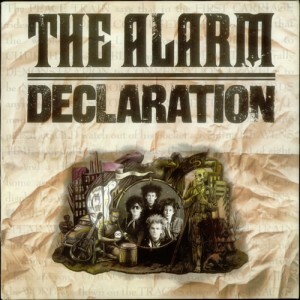 Upon its original release on February 13th 1984, ‘Declaration’, The Alarm’s debut album, instantly catapulted Mike Peters and the band on to the worldwide stage. Now thirty years later, Mike Peters will perform the entire album in full, with a unique one-man band ‘Alarm’ style show which will highlight the original alt-folk, acoustic punk protest roots of the songs that form the core of the album’s original intent. The sonic blueprint for The Alarm’s organic sound was amplified acoustic guitars, harmonica and a drum kit; a formidable sonic attack that will be reinforced in a contemporary setting this February, when Mike Peters’ ‘Declaration’ will be unveiled alongside a contemporary remake of the album that Alarm fans know so well. It promises to be an insightful evening of music, memory and innovation that will allow fans to see another side of the musician and the music that is Mike Peters. 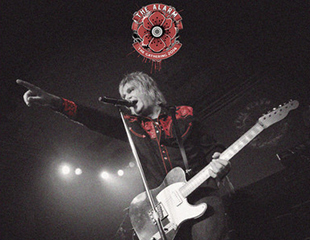 “Will Never Die” – Three words of intent from Mike Peters and The Alarm’s evergreen 1983 single ‘Sixty Eight Guns’, the epicentre of the band’s worldwide hit album ‘Declaration’ which celebrates it’s 30th anniversary in 2014. A unique one man band ‘Alarm’ show, lead singer / songwriter Mike Peters will present the album in a contemporary setting with performance, stories and images to highlight the impact that this album had on the decade it was born in, and its ongoing relevance, as Mike Peters continues his personal fight against cancer with the Love Hope Strength Foundation ‘Saving lives – One Concert At A Time’. Upon release in February 1984, Declaration debuted at number 6 in the UK charts, achieving gold record status before becoming a top 40 hit in the USA. The Alarm’s sound was powered by unique electro-acoustic guitars that no one had seen before, prompting Rolling Stone Magazine to write “One of the best new live bands…, and they’ve put a lot of that power into their first album”. The album itself, was a pioneering mix of protest punk, folk, americana and stadium rock as described by US reviewer Jim Connely in 1984′s Dead Air Diary “While a lot of bands have tried to combine the ’60s and ’70s, none of them have been as successful as The Alarm. Musically, their secret is that they draw on Punk and then temper it with an acoustic sound while avoiding the wimpiness usually associated with folk. Lyrically, it works because they avoid Punk nihilism and concentrate more on positive personal politics. This is rock and roll at its very finest and U2, R.E.M. and the rest are going to have to work very hard to top it”. 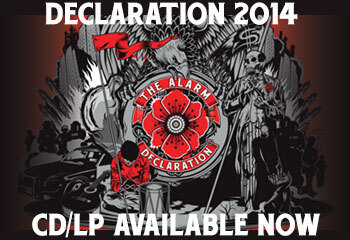 In 2014, 30 years on from the original release of the album that brought Mike Peters and The Alarm to the attention of the world, Mike is still challenging that same audience through the outreach of his music and charitable actions and literally living out the words that open the Declaration album ‘Take this song of freedom, put it on and arm yourself for the fight, our hearts must have the courage to keep on marching on and on”. Address: 1650 Broadway (51st) New York, NY 10019.